A poem handwritten by Anne Frank was sold for $150,000 at auction, more than four times the minimum bid of $32,000. There were 20 collectors who bid in person and others who bid by telephone and online, according to the report. The eight-line poem is written in Dutch in black ink on a piece of white paper that has yellowed with age. 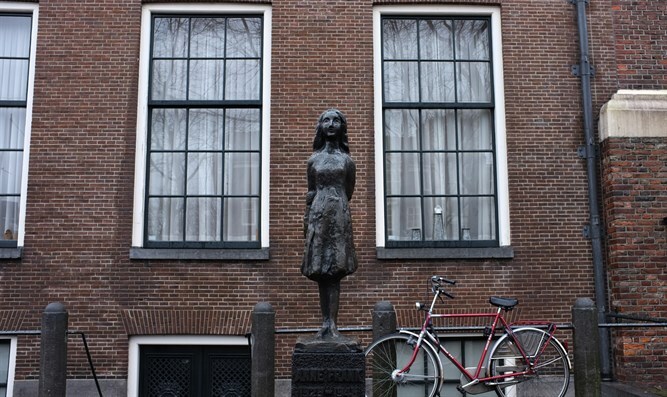 It is dedicated to “Cri-cri,” the sister of Anne Frank’s primary school friend Jacqueline van Maarsen and is advice from one girl to another. It is dated March 28, 1942, three months before the family went into hiding from the Nazis in an Amsterdam attic when Anne was 12 years old. Christiane ‘Cri-cri’ Van Maarsen died ten years ago. Jacqueline van Maarsen reportedly also has a poem dedicated to her by Frank but does not wish to sell it. Letters written by Anne and her sister Margot with American pen pals sold for $165,000 in 1988, according to AFP.